I have fond memories of being scared silly by the Martians on Saturday afternoons as a child while watching Gene Barry in the 1953 movie version of H.G. Wells‘ fabulous story of the same name. Later, as a teen, I read the actual book. Wells’ version between those covers was much better than any movie version could ever be. That’s just the nature of the written word, as far as I’m concerned. It’s been many years since I last read this book, so when I saw it on the shelf at my local library the other day, I just had to grab it. It was a fast and entertaining read. It’s not a very big book, but Wells is a master at packing in much drama and details into his stories, regardless of their word count. This particular edition was an illustrated publication. The unique view of the story from the mind and hand of artist Edward Gorey was definitely a plus. His pen and ink sketches mimic the mood of story. Sinister events just seem better illustrated in monochrome than color, I think. If you’re not familiar with the story, I’ll give you a brief overview. A species of intelligent life on the planet Mars has initiated an invasion of the Earth by firing large cylinders from Mars through space targeting an area around London. The ballistic cylinders contain a few of the Martians along with the materials and means for them to manufacture tall tripod walking/fighting machines complete with weapon systems. Using these devices, the Martians wreak havoc on the surrounding countryside and suburbs of London. The story is narrated in 1st person by a writer/researcher of sorts. His name is never given in the book. There is also a brief alternate view of the happenings in London from the narrator’s brother’s point of view, but still written by the narrator himself. Leaving one to understand that the narrator must have gotten his brother’s version post-event. Wells goes into some detail regarding the science and biology of the situation also. It’s interesting to read and consider in light of modern knowledge of mechanics, interplanetary travel, biology, and evolution. His narration of the technical aspects of the story in no way bogs down the telling of it. If anything, it enlightens the narrative a bit by providing speculative analysis of the events unfolding. For Addall.com book search results for this edition click HERE. 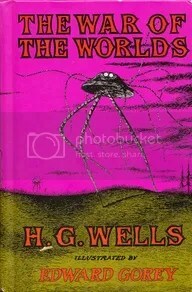 Posted by V. T. Eric Layton on 16 June 2013 in Books and Literature and tagged book review, H. G. Wells, Martians, Sci-Fi, The War of the Worlds. Awesome book! I have read it many times over my life. Nothing beats the written word. Your own imagination fills in the pictures as the author paints them in your mind. I it one of the best natural ways to escape, or transcend, the life around you. I have also seen both movies; the old one you mentioned that is so nostalgic, and the new one that is so different but good in it’s own right. I know some folks feel that way about it and it is a real departure from the book but it was a fun movie. I’m just not a Tom Cruise fan. I would have liked the movie better if anyone other than him had starred in it. I hear ya. We all have people we don’t care for that well. I loved the book/novella The Day the Earth Stood Still AND the 1951 movie by the same name. But don’t get hung up on this newer movie looking a lot like the 1951 one. It’s way different and should be enjoyed on its own merit. IMHO. Ah, yes… shame our language doesn’t have such a short way to say so many things LOL! Yep, H.G. Wells is always worth a read … and his books are always much better than any films based on them. Another “oldie but a goodie” that lots of people talk about but which no one really reads any more, is The Martian Chronicles by Ray Bradbury. It’s not a novel, but a collection of stories. Back in the day they made a mini-series out of it. I never watched it but IIRC it was very different from the book. I’m a big fan of Bradbury. So is LilBambi who reads/comments here often. I read the Chronicles many years ago; they are not my favorite Bradbury, though. I never could get into the mini-series.